This is our custom-built TS to TS Unbalanced line miniature / thin cable (TS is 1/4" mono or unbalanced connector). Construction is Neutrik TS connectors with Mogami 2368 cable. Neutrik connectors are some of the best connectors around. Mogami wire is the best wire, used in the best studios for its ultimate sound qualities and durability. 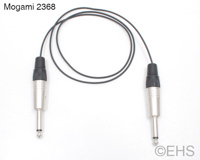 Mogami 2368 cable is very flexible, durable, light-weight cable. If you are looking for something a bit heavier, you might consider the 2319 cables. Mogami 2368 "miniature" wire is an excellent pick when a larger wire size is a problem. This is the thinnest unbalanced cable we sell at .079" thick. Don't let its size fool you. It is a great cable with 28 AWG center conductor and a wrapped shield. Though because of the thin conductors, it would be best to limit the length of the cable. Flex life is 43,000 cycles (which is very good). This is designed for low impedance applications and is not best for high impedance guitars and instruments. Photo 1 shows 3' cable. Photo 2 shows the two ends with nickel straight connectors and the back of one for a better idea of the thickness.